I must begin by saying what a rich and blessed life I lead. I have a wonderful family, great friends, faithful pups and, am fortunate to love what I do for a living. My passion for cooking began at an early age. I am the oldest of 7 children, and, although my mom is a great cook, she did not have the time to. So, when I was able to reach the stove top I began my cooking career making the family dinners. I loved it, my mom loved it. Throughout my youth and early adult years I was fortunate to learn to cook simple and easy fare with my mom’s parents. They raised 10 children in the depression, and boy, did they eat well on a very lean budget. Mostly soups, slowly braised meats, wild game and fish snared from the Niagara River. Every year a goose was fattened in their dirt basement for the Thanksgiving feast. The preparation of a meal in their home was a family affair. Lots of laughing, fun and great food. Every Friday I’d watch my aunt’s clean hundreds of just caught perch, cut french fries and make tangy-sweet slaw. Then Grandpa would cook the best fish fry on their beautiful chambers enamel stove. I was lucky enough to inherit the “black beauty” (yes, me, one of 50 grandchildren) and I’ve enjoyed it in my home for nearly 20 years. I still picture my Gram, Gramp and Aunt Betty doing their “cooking dance” as they shared the 3 burners, a small oven and dual grill-broiler while cooking a holiday feast. My dad’s mother, Gram Smith, was a gourmet cook. I learned very different, exotic dishes from her. Crab salad, New York style cheesecake, Eggs Benedict, creamy chicken liver pate’ and the perfectly poached shrimp cocktail with really hot-horseradish sauce. Gramp and Gram taught me the proper etiquette for dining and instilled in me a love for a good restaurant meal. At 14 I began my food service career at a nursing home which consisted of opening cans of icky food. My boss always had a cig hanging out of her mouth. I stuck it out for a year and acquired more people skills than cooking expertise. I loved working in the dining room visiting with the resident’s. I hold a degree in Hotel, Restaurant and Institutional Management from Michigan State University. Throughout college I was a breakfast cook and at night cocktail waitress. Both force you to be fast and organized. Additionally, I’m a Certified Executive Chef, the second woman in Michigan to achieve this status awarded by the American Culinary Federation. I am very proud of this accomplishment. I taught at Schoolcraft College in the Culinary Art’s department and was the captain of their culinary competition team traveling world wide representing them. I’ve also mentored many apprentices through Oakland Community College’s Apprentice Program. Tom hired me, from a “chain” restaurant, in 1979. We opened the second Brady’s in Southfield in 1980. We married in 1985. The third restaurant, “our baby” was opened in Novi in 1991. “Baby” was plowed down in early 2011 due to a mall renovation. Thankfully, Brady’s will live on. With lots of perseverance we re-opened in the fall of 2011. Tom died in November of 2008. It was devastating for anyone who knew him. He was deeply loved by all. 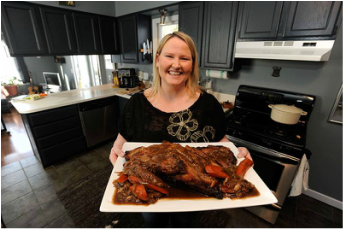 Born in Detroit in 1972, Sharon currently resides in Royal Oak with her husband, sommelier Michael Korn, and their dog Brisket. Sharon is inspired by her father, Bill Juergens, Detroit Fire Fighter, avid gardener, fisherman and hunter. Sharon’s childhood memories include picking beans from their family garden and watching her dad experiment in the kitchen with pheasant he shot and beer battering walleye he caught himself. Making “garbage soup” out of whatever was left in the fridge was a weekly event in their home. Sharon’s mother, Sandra, influenced our chef greatly through her fine southern cooking and hospitality. From “putting butter beans up” to her mom’s rice and stewed tomatoes, Sharon’s childhood was centered around the kitchen table. The whole family sat down every night for a home cooked meal and a glass of sweet tea. Sandra taught Sharon how food can nourish more than just the body, that cooking food for others can nourish the soul itself. Sous chef, Greg Brown, has over 20 years of restaurant experience. His passion for cooking started in his early teens working at quick-serve restaurants and bars. Born in Flint, MI, he graduated with a Culinary degree in 1998 from OCC in Farmington Hills. While in school he had one year stops at Muskies Urban Pier, opened D'amatos in Royal Oak and the nationally recognized Tribute Restaurant. After graduating Greg worked at Forte in Birmingham for four and a half years under Chef Tim Voss. Next was Boocoo which received restaurant of the year by Hour magazine in 2004. In March of 2006 he went to work at Big Rock Chophouse and Brewery...after a five year run he finds himself in Novi at DJBs. Greg not only works the hot line every day, he is in charge of the beer selections. So if you want to see something on our draft list, ask for Greg! When not working Greg enjoys beer, golf, bowling, playing music, spending time with friends and family...and obviously cooking.